In this crowd is the Plain White T's with the THE Delilah. The fans greeted her with a "HEY THERE, DELILAH!" as soon as they broke out of this area. They say they're coming back for more pics, but I'm a little skeptical. 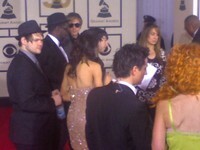 More Plain White T's photos in the Grammys Red Carpet Photo Gallery. And the non-televised winners, Kanye West and Barack Obama among them, have started rolling in. But then, PWT's and Delilah did come back. Delilah, who looked beautiful stopped by with the Plain White T's. 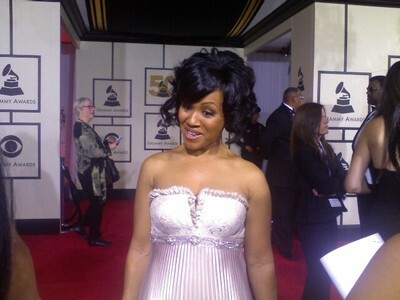 She's training for the Olympic trials and said that she's loving all of this Grammy fun. She was really sweet and looked beautiful! Oh, what'd you do to me? Erica looked really stunning and was more than happy to wait her turn for interviews and photos. She wore a beautiful strapless dress that was one of my favorite outfits so far tonight! Wearing the shortest dress on the night and some Jimmy Choos, Adrienne blew a bunch of kisses to the photographers and even lifted up her already short skirt to get the flash bulbs going.